Antique Victorian 14k Gold Pearl Sapphire Lavaliere Necklace Pendant Lavalier – A true Victorian estate statement necklace for your collection!! This is a most unusual Antique Victorian 14k Pearl Sapphire Lavaliere Necklace with its original natural sea seed pearls, baroque pearls and and dangling bezel set natural sapphire. It is marked and Guaranteed to be solid 14K gold with etched makers mark of T with a conjoined interposed S. Shaped like a crossed bar with no bail it floats independently on its 14K gold chain. The chain is later than Victorian era and works fine with the lavaliere. The chain is also marked 14K, tested and Guaranteed. Size of chain is 15″ long. The lavaliere is 1 7/16″ tall North to South from the top of the lavaliere to the bottom of the baroque pearl. Width across is just over 3/8″ wide East to West from the widest point, lower leaf edge to lower leaf edge. Weight is 2.4 grams. It is from an estate and in beautiful, crisp, original, excellent condition. No damage or repair. 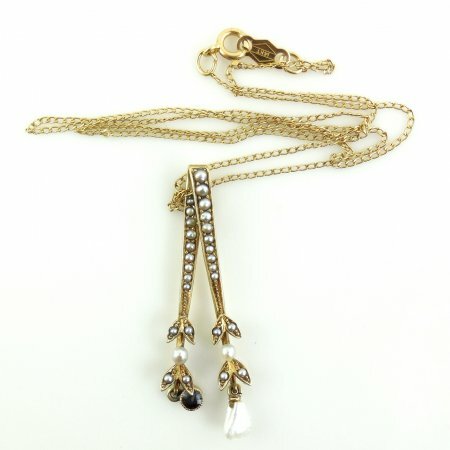 This is a stunning antique late Victorian drop pendant lavaliere necklace for your collection. 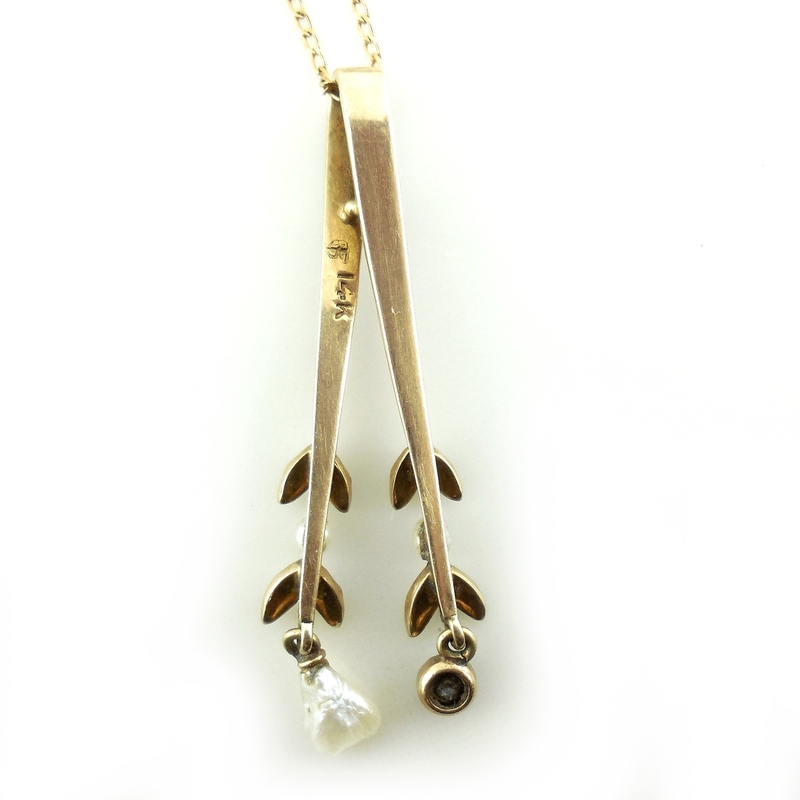 Antique Victorian 14k Gold Pearl Sapphire Lavaliere Necklace Pendant Lavalier – This is a most unusual Antique Victorian 14k Pearl Sapphire Lavaliere Necklace with its original natural sea seed pearls, baroque pearls and and dangling bezel set natural sapphire. It is marked and Guaranteed to be solid 14K gold with etched makers mark of T with a conjoined interposed S. Shaped like a crossed bar with no bail it floats independently on its 14K gold chain. The chain is later than Victorian era and works fine with the lavaliere. The chain is also marked 14K, tested and Guaranteed. Size of chain is 15″ long. The lavaliere is 1 7/16″ tall North to South from the top of the lavaliere to the bottom of the baroque pearl. Width across is just over 3/8″ wide East to West from the widest point, lower leaf edge to lower leaf edge. Weight is 2.4 grams. It is from an estate and in beautiful, crisp, original, excellent condition. No damage or repair. 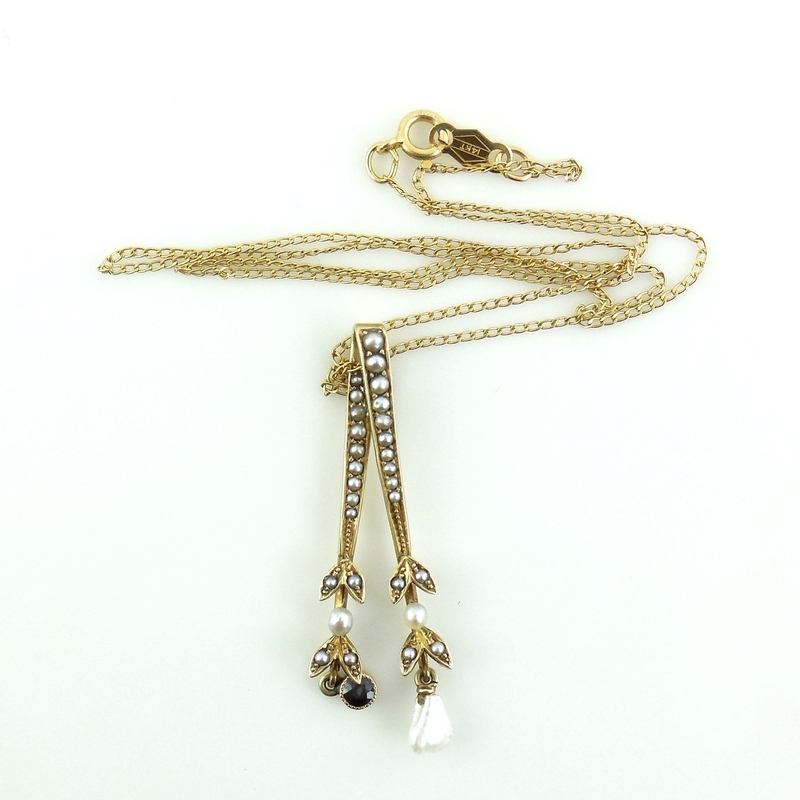 This is a stunning antique late Victorian drop pendant lavaliere necklace for your collection. Gorgeous, chunky and impressive with natural pyrope garnet and black enamel work this is a stunning 1960s 14k Gold Garnet Slide Tassel Necklace 37.4g !! Please view the photos and read the product description below. Vintage 14k Gold 8.25m Angelskin Coral Necklace 38gr - Having gorgeous light peachy pink color this is a beautiful angelskin coral necklace with its original 14K yellow gold fancy filigree clasp, 14K bead connectors and 14K fancy bell shaped spacers. It is marked 14K. ***It is strung tightly so you may want to add an enhancer or large pendant to weigh it down or restring it less tightly. 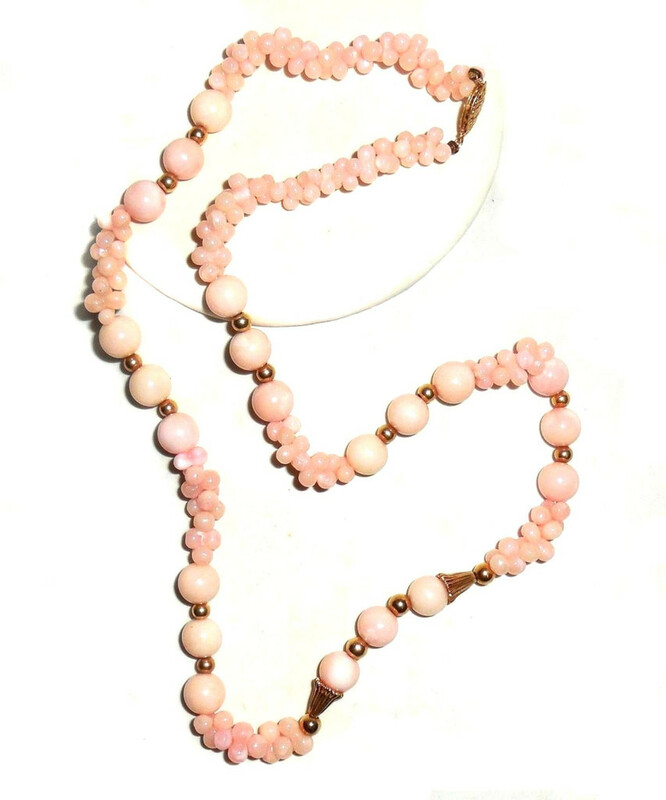 The beads are beautiful peach to pinkish white color with each bead having its own individual characteristics. The round beads are 8-8.25mm each and they are accented by 9mm dogbone coral separators. Size is 21″ long. Weight is 38 grams. This is a gorgeous 14K gold coral necklace for your collection; it has lovely colors and is excellent condition. No damage or repair. 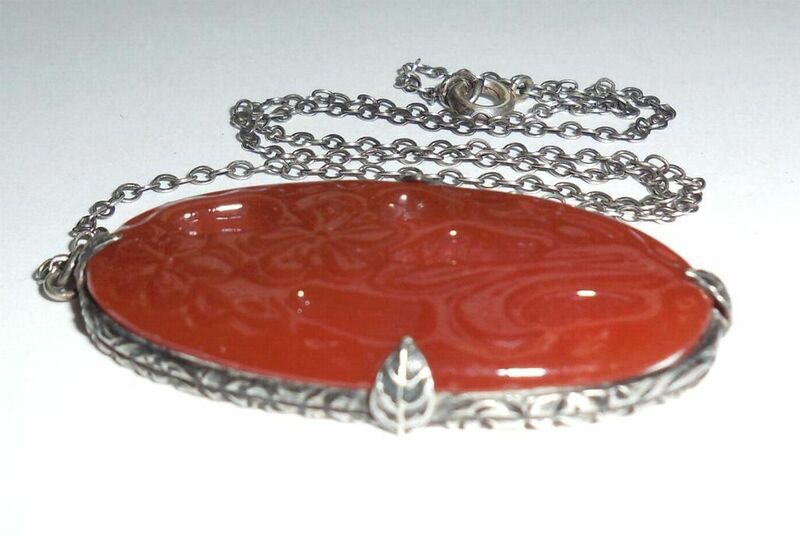 Please see all photos so you can view the detailed carving on this necklace......In excellent condition and still having its original 1920s-1930s chain and bolt ring clasp this is a lovely vintage Art Deco sterling silver Chinese carved and pierced peony flowers carnelian or red jade necklace. It is old and not marked But is Tested and Guaranteed to be solid sterling silver. Not plated. The centerpiece is 1 3/4" tall North to South by 15/16" wide East to West. The chain is 15 1/2" long for a smaller neck. The stone has beautiful deep floral carving that is pierced through with open work. The setting has 1920s-30s carved leaf prongs and the sides of the bezel are deeply carved all the way around. Stone translucence is good. No damage and never repaired. 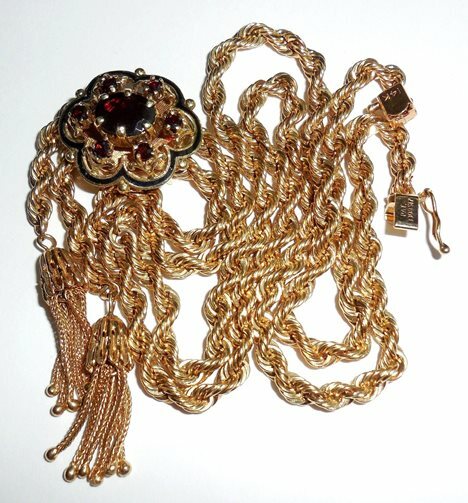 From an estate and in excellent original condition this is a gorgeous necklace for your jewelry collection.